A while back (a long while back!) I'd read and deeply enjoyed House of the Stag. It's the only book I'd read by Kage Baker, so I determined to check out more of her work. Some light research revealed that she has written a series generally referred to as The Company, so I (eventually!) picked up the first entry, In the Garden of Iden. Unlike House of the Stag, which was a really creatively constructed fantasy novel, In the Garden of Iden is an unusual science fiction novel. It's more focused and traditional than HotS, and has a surprisingly strong romantic component. While it wasn't what I expected, I really enjoyed it... the book does a great job at setting up its universe and tells a very compelling story that is both very personal and historical. The book gets off to a great start with the absolutely brazen way that it sets up its premise. This is a sci-fi novel, and it relies on two futuristic inventions, time-travel and immortality. Instead of doing the in-vogue thing of having the reader inhabit the world for a while and gradually glean the way the underlying system works, here the narrator directly lays everything out before the story even starts. You can travel to the past, and then back to your present, but not into the future. Immortality is possible, but only children can be made immortal; they will grow into adults and stay youthful forever. The best part, though, is that you can change the past, but only in minor ways. More specifically, you can't do anything that changes recorded history. So, for example, you can't stop the Library of Alexandria from burning; but you could sneak into the library, photocopy all of the scrolls, hide them in an out-of-the-way cave, then dig them back up in the year 2500. Of course, it makes no dang sense that the determining factor in whether an event can be changed is whether it was recorded or not; except that we're reading a sci-fi novel, and so of course they can't change events that we, the readers, already learned in history class. This neatly sets up both the premise and the sensibility of the novel. It reads like historical fiction, with lots of period details, except that the protagonists are from a sci-fi novel, with advanced technology and perfect knowledge about what's going to happen. The narrator and main character, Mendoza, is recruited for immortality from her poor upbringing in 1500s Spain. She's a good character, and also a canny choice for the first novel in this series: because she's a young, new field operative, there's a good in-universe explanation for why other characters can explain basic things to her, like relationships between mortals and immortals or the proper protocol for dealing with potential disasters. The Company itself is a fun invention; I really enjoyed the blasé attitude that all the experienced field operatives have. They're actors, putting on a show for "the monkeys," for whom they feel some mixture of disgust and pity. Joseph in particular is fascinating, with his self-consciously histrionic outbursts and core of utterly competent rationality. Even though all of the employees go through the same conditioning process, they're unique individuals, and end up with room to carve out their separate identities and quirks. Nonetheless, they've all been brainwashed and programmed by The Company (and are aware of this). There's a sad nonchalance to the way that Mendoza states, near the end of the novel, that she has no free will. It's hard to believe that after sharing her thoughts for the entire book, but she's declaring the reality of the world she lives in. Once I understood the nature of The Company, I was expecting this book to read something like To Say Nothing of the Dog, another great time-traveling book by Connie Willis. Instead of hopping around between various dramatic points of interest, though, this book settles down and spends most of its time in the titular Garden of Iden, a backwater English country manor. Several plots are swirling around: The Company is trying to extract valuable botanical data while remaining undetected; Queen Mary is ushering in an attempted counter-reformation that is causing distress in much of England but is vaguely welcomed by the nominally Catholic residents of Iden; and Mendoza falls in love with a stern Protestant bookkeeper named Nicholas. The plot lines swiftly entangle, with tension mounting as heretics are burned and Nicholas grows suspicious of the guests. I was a bit surprised by how much of the book was devoted to exploring Nicholas's character and his relationship with Mendoza, but this ends up being the heart of the novel. It felt a bit like Pride and Prejudice or Jane Eyre at times, with Mendoza the bright and resourceful young woman and Nicholas the outwardly dour young man. But here, they form a union much sooner, and the book is more devoted to exploring the aftermath of their relationship. Mendoza is living a lie, and Nicholas has a sense of the deception, but their attraction is strong enough that they feel compelled to continue despite the risks. I'm still a bit unclear about exactly what was going on at the beginning of the book. After the introduction, I'd assumed that the rich lady and her followers who purchased Mendoza were Company agents. Their later capture and interrogation seems to contradict that. Still, I'm left wondering if that might have just been the first stage in Mendoza's recruitment: they were maneuvering her into a situation where she would be sufficiently psychologically desperate for the next stage of her conditioning. If that's not the case, then just what were they? Witches? A religious minority? We never get a clear answer; presumably Joseph knows the whole story, but he never hints to Mendoza that it was anything other than what it seemed. This is probably just me making stuff up, but part of me wonders if Sir Walter might later become Walter Raleigh. Pretty much just because of the similar name, but the dates are intriguing as well: Walter Raleigh's birthdate is disputed, and Sir Walter has aged into a younger body, and apparently will remain youthful for some time. His vigor and ambition seem well-suited to becoming an explorer and adventurer. Alternately, I could imagine the young child from the Christmas feast growing into this man; Mendoza seems to pay particular attention to him, although nothing important about his future is revealed in the novel. This was a really fun read, and I'm curious to see where the story goes from here; this episode is definitely neatly wrapped up at the end, but there's almost endless potential with the scenario Kage Baker has created. I could see us continuing to follow Mendoza's career throughout linear time, or jumping around to see different operatives at different eras, or even a bigger-picture view that shows the actual people behind The Company. It's always nice to have something new to look forward to. The Dragon Age novel-writing torch was recently passed from head writer David Gaider to new teammember (but established author in his own right) Patrick Weekes, and the first product of this new combination is The Masked Empire. This novel came out earlier this year, and covers roughly the same time period as Gaider's Asunder, helping lay the groundwork for events leading into Inquisition. I've been looking forward to this book for a while. Weekes hasn't been immersed in Dragon Age lore for as long as Gaider (who did much of the work to invent the setting), but he's a long-time BioWare writer, and wrote some of my favorite characters and arcs on the last two Mass Effect titles, including Mordin, Tali, Priority: Rannoch and Priority: Tuchanka. By this point Thedas (the world of Dragon Age) has been very well developed, and I'm always excited to see what new pieces of art people will create in it. I'd been curious how Weekes' style would be different from Gaider's. They're pretty compatible, so it wasn't jarring to jump into TME after the first three novels: there's a similar mixture of background world-building, character development, and action, with a mixture of humor and horror sprinkled throughout. Weekes did seem to be a bit more focused on dialogue and less on battles than Gaider, though it's hard to say how much of that is due to the writers and how much due to the setting; Orlesian court drama is generally (though not invariably) less violent than the Deep Roads. The book is, of course, a good and fun read, engaging as a story while also satisfying my craving for more lore about Thedas's history and culture. While Asunder was mostly focused on magic, Templars and spirits, TME focuses more on Orlais and the elves (both city and Dalish, and particularly the differences between the two). There's some overlap between the books - Leliana is quite active as a fixer and the Divine's right hand, and each group of heroes is vaguely aware of events taking place in the other book - but they diverge fairly early on and manage to get pretty deep into their respective areas of concern. I've been intrigued by Empress Celene for a while now (and only now while reading the book have I finally realized that the name Selene Hawke comes close to infringing on the name of the famous monarch. Whoops!). In Dragon Age: Origins, Loghain was paranoid and obsessed with the idea that Celene was plotting to re-conquer Ferelden, which had just won its independence a generation earlier. In the DLC Return to Ostragar, you learn that his paranoia was actually well-founded: King Cailan had failed to produce an heir with with Loghain's daughter Anora, and there were secret discussions about divorcing Anora to marry Celene. It would have been a stunning coup, and in this book we can see that gambit from Celene's perspective. She wasn't attracted to Cailan - in fact, I'm not sure if they had ever met - but she wistfully reflects on how that single act could have united two nations, secured Orlais's southeastern flank, quieted anti-Orlesian sentiment within Ferelden, allowed her to divert more resources to her social, economic, and cultural projects, and presented a formidable front to the Tevinter Imperium. To put it bluntly, I like Celene a lot. She's a schemer, but one who schemes to good ends: she uses guile, duplicity, and flattery in her pursuit of a better society. She isn't a starry-eyed idealist, but has the clarity to see where conventional wisdom holds her people back. Many people would oppress the elves because they believe them to be inferior; others would seek to elevate them out of a moral belief that they have equal rights to humans; Celene elevates them because she recognizes that they are valuable assets that can make her country stronger. She does have one (and possibly only one) vulnerable spot, which is her love for Briala, an elven servant who has been her friend since childhood and her lover in adulthood. As a side bar, I've come to really appreciate the way Dragon Age looks at sexuality, which is to say, it has a nuanced and expansive set of mores that vary from nation to nation. On Earth, different societies at different times and places have held varying attitudes towards what's proper, variously encompassing polygamy, monogamy, bisexuality, etc. Likewise, in Thedas one might find that homosexuality is uncommon in Ferelden; in Antiva, it is much more accepted; Orlais and Tevinter have elaborate etiquette around relationships, with a focus on producing favorable bloodlines (of political prestige in Orlais and of magical power in Tevinter), but much leeway granted once such duties have been fulfilled. Anyways! Celene keeps their relationship secret, as it breaks almost every taboo. Not so much that Briala is female, but more because she is an elf and a member of the lower class. Celene recognizes that her hand in marriage is a powerful trump card, which will have a lasting impact on the future of Thedas, so she holds that card in reserve while she quietly pursues her happiness with Briala. Caught between two worlds, Briala fully understands Celene's realpolitik, but also has a strong emotional sense of obligation towards "her people," the oppressed elves. The affection between the two women is genuine, and at the same time, they're each aware of the quid pro quo involved. Briala devotes her considerable skills to keeping Celene secure on the throne; Celene goes farther than she otherwise might in promoting elven interests, going so far as to promote elven matriculation in the universities, support tax policies that will benefit poorer elven (and human) merchants at the cost of wealthier nobles, etc. This simultaneous mixture of romance and ambition makes for a great dynamic that does much to propel the story. The single most mysterious character in the book is probably Felassan. It's tough to figure out what he even is. He presents himself to Briala as a Dalish mage, but I found myself questioning that very early on: he never introduces her to any other elves, and grows extremely evasive whenever talking about his "tribe". For much of the book I thought he was either a spirit or a demon, possessing some useful body to further his opaque agenda; at one point I thought he might be an incarnation of Fen'Heral, the Dread Wolf of Dalish legend; near the end, I suspected that he might have been one of the Dreamers who slumbered through the fall of Arlathan, and is wandering the current world to do... something. While I may not have understood him, I did enjoy him. Like most characters in these books, he has a quick wit, and manages to amuse even while he baffles. He had a particularly interesting relationship with Briala, one that is kind of protective but also sort of gently pushing her to take more responsibility. He's curiously passive for much of the story, lending his considerable power in support of whatever plan his companions have most recently devised. Michel de Chevin is one of the most purely likeable people in the novel. He has a Dark Secret, which has shaped most of his life, but learning how he overcame his circumstances only made me appreciate him more. Orlesians in Dragon Age are famously obsessed with honor, and in the games that often comes off as pompousness, but Michel is a great example of the positive results that are possible from such a devotion to duty and training. And, weirdly, that same devotion to honor made me a grudging admirer of Gaspard de Chalons, who is the obvious villain for most of the novel. Gaspard wants to be Emperor, and has been using all the tools at his disposal to acquire the throne. He fails to match Celene's skills at politics, and so he turns to his considerable skill at arms. 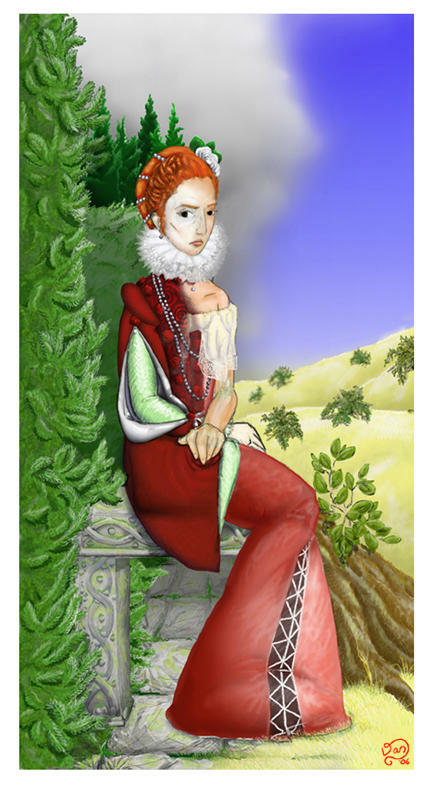 He has won many victories in battles, which makes him feel entitled to rule the nation; Celene has prevented many wars from even starting, which makes her feel entitled to the same. They present two strongly opposed viewpoints about the role that Orlais should play in the world, and what makes Orlais great. I am, of course, fully sympathetic to Celene's enlightened policies, and opposed to Gaspard's reactionary, racist, warmongering ways. Yet, despite all that, I can't help but admire the man. He has a code that he adheres to, trumping even his desire to rule the realm. He believes that it is his devotion to duty that makes him fit to reign (shades of Stannis!) and refuses to make the kinds of compromises that would win him the crown at the cost of his honor. In contrast, as Celene's situation grows more dire she reveals herself completely willing to take any advantage, forge any alliance, sacrifice any ally, do whatever it takes to come out ahead. While I continued to intellectually agree with her throughout the novel, by the end I found it difficult to emotionally endorse her decisions. Of course, this is a major part of what Dragon Age is all about: for the most part, there is very rarely a clear-cut "right" and "wrong" side of any given argument. The early stages of the Gaspard/Celene conflict reminded me of the Harrowmont/Bhelen division in Dragon Age: Origins, with Gaspard/Harrowmont representing the cultured, traditional, honorable, caste-based society, and Celene/Bhelen promoting a modernizing, more egalitarian society. Needless to say, BioWare doesn't repeat themselves: Gaspard is far more aggressive than Harrowmont, and Celene doesn't share Bhelan's bloodthirsty ruthlessness, preferring instead to diplomatically neuter her opponents. Anyways, that's one of the many things that I love about Dragon Age: while many books and games will present a villain, and throughout the story demonstrate just how fully bad that villain is, so we can all cheer when the villain is defeated at the end, BioWare is much inclined to do the opposite: present someone absolutely awful at the beginning (Loghain's betrayal at Ostragar, Gaspard in TME), then humanize them throughout the story, leaving you unsure where your sympathies lie by the end. This rings more true to me than a lot of fiction. There are evil people in the world, but for the most part it's different people all trying to do the best they can by their own lights. TME also pulled off the neat trick of retroactively endearing me to a character. Much like The Stolen Throne made us all fans of Loghain, The Masked Empire does a lot to redeem Duke Prosper, the villain of Mask of the Assassin. In that game, I had been completely under the sway of Tallis / Felicia Day, cheerfully agreeing that we should rob the Duke and protect the identities of the Qunari spies embedded in Orlais. I was initially taken aback in TME when Celene flashes back to a fond memory of Prosper, and thought, "Wait, Prosper? Wasn't he the bad guy?" But, once you start looking at it from the perspective of an Orlesian, the situation changes dramatically. The Qunari have been one of the biggest threats facing Thedas for centuries, and Prosper, a refreshingly loyal servant of his Empress, is acting to keep them from conquering yet another land. I'll probably play through MotA again before too long, and next time it'll be much harder to decide whether and how strongly to support Tallis's mission. Man, between Asunder and TME, things are looking really grim in Orlais. The Templars have revolted against the Chantry, the mages against both of them, a faction of Orlesian nobles are revolting against Celene, and it looks like there's a good chance of the elven ghettos rising up within the cities. And this is all before the sky opens! It'll be interesting to see how all of this plays out in Inquisition. I'm vaguely imagining something similar to Origins' plot structure, with multiple major plots running at the same time, and you picking and choosing the order in which to resolve them. Eluvians have been a big part of Dragon Age at least since Witch Hunt, and this was by far the best explanation we've gotten yet about how they work. It reminded me in some ways of systems that have been developed in other fantasy novels to solve the problem of "How do I get the characters from this side of the map to that side in a short amount of time? ", somewhat like the Ways in The Wheel of Time. In Thedas, though, the Eluvians were developed by the Elves, which has some interesting effects (most notably, humans find it more difficult to move through those spaces). I find myself wondering whether Imshael will be one of the antagonists in Inquisition; he certainly seems to intend causing some mischief. Other major candidates (besides Gaspard) include whoever kills Felassan at the end. On the canon front, I was quite happy with how the novel positioned itself: Leliana is still alive (which has been well established by now), but I don't think it gives any details about who rules in Ferelden or other major decision points from the games. So, between the time I started writing this post and now, I've learned that Inquisition has been delayed six weeks, until November 18th. My immediate reaction was dismay, but upon measured reflection, it's an almost unquestionable good move. I'd always much prefer a game to be released in a polished and mostly-bug-free state than released early. I'm attending a wedding the weekend after the original release date, so now I'll be able to focus on my duties without worrying about my incipient dual-wielding inquisitor. And I'll actually get a chance to play Civilization Beyond Earth instead of waiting until 2015 like I'd thought I would need to do. And, heck, in the worst case I'll now have two full months to check out Last Flight after it drops in September. 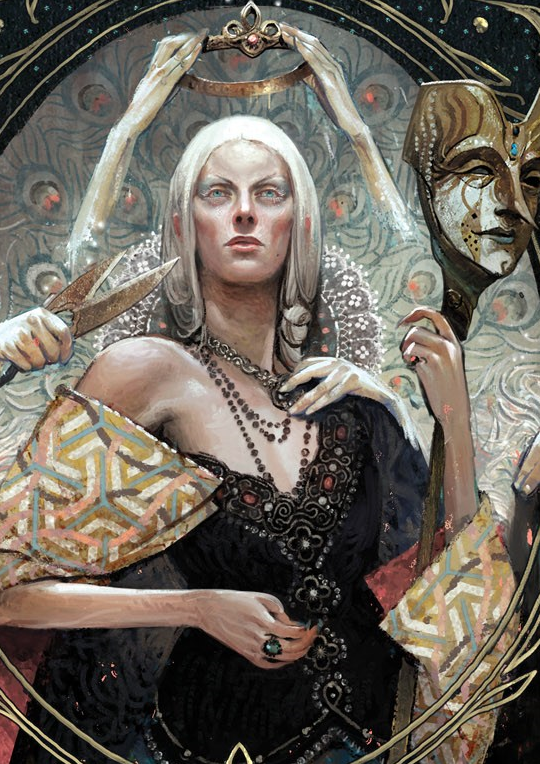 But, yes, back to The Masked Empire: it's a fun book, probably one I'd suggest primarily to people who are already fans of Dragon Age, have played through the games, and are looking for more. I didn't think that it stood on its own quite as well as The Stolen Throne and The Calling did; but that's because it gets a lot of mileage building on top of things we already know (Bann Teagan, the fraught history between Ferelden and Orlais, the plight of the elves, etc. ), so there's extra resonance and treats for people who enjoy the setting. It also should reassure anyone who might have been apprehensive about Patrick Weekes' move to join the Dragon Age team: he clearly groks the setting and the tone, which bodes very well for his contributions to the upcoming game. I have a vague strategy to provide myself with a steady drip of Dragon Age-related goodness until Inquisition finally arrives in October. Fortunately, a wide variety of official non-game material has been published over the years, so this has been the perfect excuse to get caught up on the novels. I seem to be timing it rather well: Patrick Weekes' The Masked Empire was released earlier this year, and a fifth novel will be appearing in September, which should provide the perfect way to coast into some fine gaming goodness. For now, the novel I just finished reading is Asunder, the third and final entry written by David Gaider. It's interesting in a few ways. Perhaps the most obvious is the difference in setting. The Stolen Throne and The Calling were both set prior to the events of the first Dragon Age game. Asunder, in contrast, takes place after the first two games and shortly before the start of Inquisition. So, the first two books were extremely lore- and canon-friendly: they provided excellent additional background that helped fill in some gaps from the games and provide additional color and texture to some elements of those games' plots. I think Asunder does a fairly good job at navigating this territory, although your mileage may vary. It does include some characters from the first game, and references several plot events. Most of the plot events are fixed in the canon of Dragon Age and will always be true. The Warden is a revered figure in this novel, and Gaider pulls off the challenging task of describing their role while leaving them perfectly compatible with any possible origin and outcome. The story does make several assumptions that are less sure; the big ones happened to be correct for me, and I imagine for the vast majority of players, but there's a good chance that some players out there will feel some dissonance at who appears in this book. The writing itself is very well done. I think that each of the three novels I've read has been better than the one before: the writing has gotten more confident and more fluid with each book. The earlier ones felt very focused on the individual characters and a few set-piece battle scenes. Asunder felt more focused on the story as a whole: there are still some great characters, but it feels like narration now pulls relatively more weight than exposition. There are still battles, but they seem to arise more gracefully and resolve expediently. Both characters are fantastic here. The writing is sharp and feels perfectly true to their characters. I know that Gaider wrote Shale; I'm not sure if he wrote Wynne or not, but he perfectly captures her demeanor (generally kind, but condescending, and occasionally prone to outbursts of exasperation). Wynne is a bit more active in the plot while Shale seems to be around mostly to be very sarcastic and to smush soft squishy things, an arrangement that appears satisfactory to everyone. If this book has a hero, it's Rhys, a Senior Enchanter and Libertarian at the White Spire (the Orlesian Circle). Rhys later learns that he's Wynne's son; and, although I don't think he is privy to this information, we know from Wynne's banters in DA:O that this probably means that Rhys's father was a Templar. Rhys seems like a decent, kind man... he's beset by extremists, but argues for sanity, and goes out of his way to stand up for people he feels have been wronged. One of those wronged people is Cole, a mysterious young man who lurks in the basements of the White Spire. Cole's exact identity is a puzzle for most of the book; he will be one of the Inquisitor's companions in Inquisition, and I'll be curious to see if they revisit any of the revelations of this book. If not, I could see this being somewhat akin to the expansion of Loghain's character in The Stolen Throne, where the book provides significantly more context and coloring to a character. Anyways! Cole is interesting, and sad, and strange, and while I'm not sure I'll have room for yet another rogue in my party, I look forward to speaking with him in October. Actually, other than Rhys and Cole, pretty much all of the other significant characters in this book are female... cool! In addition to Wynne, Shale, and Fiona, we also meet Adrian, a fellow Senior Enchanter and Libertarian. She's far more radical than Rhys, and has been agitating to capitalize on the upheaval after the upheaval in Kirkwall to dissolve the Circle of Mages. She has unrequited feelings for Rhys, which is actually pretty interesting... I've read a ton of books where the girl doesn't love the boy, but this is one of the few where the boy doesn't love the girl. You can get inside both their heads regarding their relationship; while it's far from the most important thing in the book, it adds some really nice melancholy. Instead, Rhys's main potential love interest is Knight-Captain Evangeline, a Templar of the White Spire. I really liked her character, and I'm probably pulling more for her than any other character here to appear in Inquisition. One of the many things I love about the Dragon Age franchise is how it avoids sweeping generalities: it regularly shows that any institution is made up of many members, and those members will cover a broad spectrum of beliefs. Evangeline is a devout Templar, and adheres to the core of Templar doctrine, recognizing that their core goal is to protect the mages. This provides a welcome contrast to the outright hostility we generally see on both sides. Throughout the novel she's probably in the toughest position, torn between conflicting orders from her immediate superior officer and her supreme commander, traveling with allies she cannot trust, and being forced to lead without access to the information she needs. She bears up extremely well under the pressure, and emerges as possibly my favorite character here. We also catch a glimpse of the Divine, the recently-elevated Justinia (replacing the elderly Beatrix, who I previously saw in Dawn of the Seeker). She plays a major role in the events here, and doubtless will continue to do so in Inquisition. We also hear of, but do not see, Celene, the Orlesian Empress. She's involved in some sort of civil war near the Ferelden border; we never learn exactly what this is about, but I wonder if it might be related to the canceled Exalted March DLC for Dragon Age 2. It's very possible that these events will grow clearer once I read The Masked Empire. And, last but certainly not least: Leliana, my love! This was some particularly deftly done writing. Of course, not all players will have romanced Leliana; but, for those of us who have, it's easy to read some extra meaning into her words and project our thoughts about their romance into her scenes. What's interesting about her is not so much how she's similar to the character of the first game, but the ways in which she has deliberately changed. This whole business about her evolution into Sister Nightingale is all very mysterious, and is one of the things I'm most looking forward to discovering in Inquisition, not least because I suspect her motivations may radically change based on the Warden's actions. The templars-versus-mages thing has obviously been one of the major driving forces for most of the Dragon Age series: it's a crucial component of one of the four major questlines in Origins, is the single most important element in Dragon Age 2, and appears to be one of, and possibly the, biggest plots of Inquisition. I suspect that by the end of the next game, that question will be settled, and I'm mostly curious if the Inquisitor will be able to affect the outcome or not. In the meantime, Asunder really drives the blade home, showing just how desperate the situation in Thedas has become. So, yeah! Good book! This is probably essential reading for anyone who's enjoyed the games and wants to get more out of them. I've enjoyed all the Dragon Age novels so far, but I think this is my favorite one to date: it's very well-written, ties into the games in a very satisfying way, and holds the promise of deepening our enjoyment of Inquisition once it drops. It's a bit of a shame that we won't be getting any more novels from David Gaider any time soon, but in the meantime I'm looking forward to what Patrick Weekes has in store for us! In a weird bit of synchronicity, I finished reading Neal Stephenson's "Some Remarks" on the same day I finished re-watching Serial Experiments Lain. I had initially thought of doing a separate blog post for each, but they aligned in some kind of freaky ways, so I'll go ahead and debrief here while it's still fresh. I absolutely did not plan to consume both of these media at the same time. I'd pre-ordered the Lain Blu-Rays last year after they were announced, and had forgotten I had done so until they showed up in my mailbox a few weeks ago, after I had already cracked open Some Remarks. I was looking forward to both of them, and both ended up exceeding my expectations. Neal Stephenson has been one of my favorite authors ever since I read "Snow Crash" back in college; I'd already read a few of the pieces collected in "Some Remarks," and was honestly getting it for completeness' sake as much as anything, but ended up being blown away by a few longer essays that I'd never read before, most notably "Mother Earth, Mother Board." Somewhat similarly, Serial Experiments Lain has long been my favorite anime series, and one of my favorite works of fiction in any medium. It's been years since I last watched it, and even longer since I'd seen past the first couple of episodes (my standard gambit for introducing folks to this mindblowing series, which typically ends with them running away screaming). I'd felt slightly apprehensive that it wouldn't live up to my idealized memory of it; in practice, it actually exceeded it. The Blu-Ray upgrade makes the art even more beautiful than before, and the odd perspective it took on technology has made it seem weirdly prophetic rather than dated. The mantra of Lain is "everything is connected." What this actually means is very much up for debate: Lain is one of the most determinedly opaque pieces of fiction I've encountered, and I still refuse to investigate wikis or anything else that would destroy the mystery; I enjoy the sensation of my mind chewing over it too much. Still, every time I watch it I feel like I'm getting closer to some sort of understanding. Even though the conclusions are unclear, the questions are relatively easy to spot: how constant connection and communication affects us as individuals and as a species; whether the Internet represents a fundamentally new thing or an evolution of previous analog networks; exactly when one's existence begins and ends; the extent to which we can ever truly know another human being. Thesis One: The Wired was created by humans, out of physical materials in the world. It exists on top of our society, and can only reflect ideas that already exist within that society: nothing new can emerge from within the Wired. Thesis Two: The Wired was created by humans. It grew in complexity, and now has an equal level of reality as that of our universe. (To crib from another Stephenson novel, it holds an equivalent position on the Wick.) Events that begin in The Wired can affect the real world just as strongly as events in the real world can affect The Wired. A thing (e.g., an idea or a memory) can continue to exist in the Wired even if it no longer exists (or never existed) on Earth. Thesis Three: The Wired is a digital manifestation of the collective unconsciousness that our species already had. Ideas can emerge and hold power from The Wired, but such ideas could also emerge in the past from analog sources (mysticism, religion, metaphysics). Such impulses in the past have guided our civilization's growth, and thus in a sense the Wired invented itself. The series seems to end with a suggestion that Thesis Three is correct, but I'm far from confident in saying that. Throughout the show, we regularly get one character or another stating with great assurance "You must not forget that The Wired is just an upper layer of the real world" or "The Wired is not, after all, an upper layer of the real world." In any other show, we would be led to the "correct" answer, but Lain seems to delight in muddying the waters, forcing us to think for ourselves about what explanation seems most plausible (or least distressing!). This muddying extends beyond the words to the actual actions in the anime. Another enormous mystery that runs throughout the entire show is the identity of the "other" Lain. We understand several properties of her: she looks like Lain but is more confident, aggressive, and skilled. At one point, it seems like the "real" Lain has cracked the mystery: she confronts Taro, stating that the "other" Lain is only a product of the Wired; in the real world, she has only ever been spotted within Cyberia, which is a sort of threshold spot (not unlike one of the "thin places" of religious revelation) where the Wired can easily manifest thanks to the prevalence of projecting electronic devices. Mystery solved! And yet... only an episode before, we saw another Lain step out from her own body, greeting her classmates and cutting her off. That certainly didn't happen in Cyberia. It's pretty hard to interpret that scene as anything other than the Lain of the Wired manifesting in the real world, a doppelganger supplanting its double. And, of course, a few episodes later we'll learn the bombshell that the Lain of the Wired is the original Lain; and the "real" Lain is the copy. Presuming, of course, that we can trust the man providing this information. The truth of this conundrum seems inextricably tied to which of the three theses we can accept: is it possible for a being to emerge from The Wired, and if so, could that being then influence "reality"? These aren't new questions, but they were pretty new at the time the show was created. Lain was originally created in the mid-to-late 90s, before The Matrix and Eternal Sunshine of the Spotless Mind and other movies that played around with these sorts of concepts (though, to be fair, well after Gibson and Stephenson and Ghost in the Shell). Still, I think that the show has aged really well, partly as a result of its light touch on matters of technology. Inevitably, works of cyberpunk that try to be very specific about how technology is going to evolve end up seeming laughably misguided after only a decade or so. When Lain does make predictions, they end up being correct with startling subtlety. It took a while for me to realize the oddness of a class full of students with wireless Internet-enabled devices: it is ubiquitous today, and impossible to imagine back when the show was created. Ultimately, Lain is more interested in philosophical and existential questions that underlie not just the Internet but the universe as a whole, and so it continues to feel very relevant today. It's that same continuity that makes Stephenson's Mother Earth, Mother Board almost shocking to read. Near the end of the essay, he quotes one of his sources as saying that, when it comes to digital communications, in the last one hundred and fifty years there have been no new ideas, only improved techniques. It's a shocking thing to say, but by that point in the essay I feel compelled to agree with him. Using the same techniques that he deployed so effectively in The Baroque Cycle, Stephenson shows how a modern institution was, for all practical purposes, completely formed in a short amount of time long ago. The primary focus of MEMB is the physical structure that underlies the Internet: more specifically, the undersea cables that connect the continents together and enable the global exchange of information. It's a long, sprawling, and completely engrossing essay, covering every conceivable aspect of this: how cables are financed, how they are insured, who runs the project, how they are installed (different for every country! ), the hazards they face, the politics of their creation and utilization, how data gets transmitted over those wires, etc. It's a bit humbling to think that, when I visit the legacy web site for Serial Experiments Lain, my request is getting put onto a wire, traveling 5,400 miles across the Pacific Ocean, connecting to some computer over there, then that data is coming back to me over another 5,400 miles before forming a picture in my web browser... and that all of this technology is fundamentally identical to that which was used in 1858 when the first transatlantic cable was laid between England and America. So, much as Lain seems to be somewhat ambiguously suggesting that The Wired isn't really anything new, Stephenson points out that today's global telecommunications regime is a matter of increasing intensity, not something truly original. The kinds of debates we hold now, about whether we are too easily distracted, whether constant communication is changing our minds and relationships, are exactly the ones that people were writing about back in the Victorian era. This isn't to say that the Internet isn't important: but, the Internet is the current state of evolution of a process of technologically binding people together which has been progressing for a long, long time. The rest of Some Remarks is also really good, although nothing else quite reaches the level of virtuosity of MEMB. The infamous Slashdot Interview is freely available online, and is pretty essential reading for anyone who liked reading, even if you don't like Stephenson. There's also a fascinating short story called The Great Simoleon Caper that perfectly predicts the rise of BitCoin, DogeCoin and other crypto-currencies, albeit not the practical difficulties they would encounter. (Oh, and you know those annoying windows that appear on web sites and say things like 'Hi, I'm Tiffany! Ask me if you have any questions!'? It also anticipated those by a good ten years or so.) The rest of the book is a solid collection of stand-alone short fiction, essays that expand on some topics he's already treated in fiction (notably the Royal Society feud between Newton and Leibniz), and some great one-off pieces like his introduction to David Foster Wallace's book on infinity that plumbs their shared experiences growing up in Midwestern college towns. Near the end of the book is a somewhat depressing essay about the failure of science fiction to inspire the next generation of scientists and engineers, which Stephenson links to a broader tendency in our modern capitalist society to avoid risks. He points out that the wide-eyed idealism of early science fiction, from Wells and Verne up through Heinlein in the 1950s, gave tangible goals for society to pursue; later science fiction, which tended to be more dystopic, was more focused on showing the perils of progress. Almost all of cyberpunk falls into this category: the future might look cool, but it also has serious and dangerous problems. Lain, which isn't exactly cyberpunk, seems to glide past this distinction. It isn't encouraging us to step forward into a bright new future, nor is it cautioning us against what tomorrow will bring. Instead, it's asking us to think, to ask questions, to wonder what it means to be human and how our embrace of technology might be changing us. I don't think that Lain will inspire any entrepreneurs to build a new artificial intelligence, nor do I think it will inspire politicians to set limits on children's use of the Internet. I do think that it could inspire a new generation of philosophers, or merely informed citizens, who could help our children understand the questions that I struggle with while watching this remarkable series.